Let’s think about one of the most gargantuan businesses the world has ever seen – Amazon. Up until only very recently, if you wanted to buy something from Amazon, you couldn’t pop down into the town centre and visit your local store – because such a thing didn’t exist. It still doesn’t, in fact. True, the ecommerce goliath may now be experimenting with a few bricks-and-mortar retail outlets, but essentially, Amazon has become the world’s eighth largest retailer through the strength of one thing and one thing alone – its website. Without its brilliant, beautiful and intuitive website, Amazon would have died a death many, many moons ago. Since we can’t physically go to our nearest Amazon, we have to go to its website instead – and we certainly do that by the million. However – I can hear what you’re thinking. Amazon is an ecommerce player, right? So by definition it relies on its website to conduct business with consumers. And that is of course true – but don’t be fooled. Your website – no matter if you’re ecommerce, B2B, Software as a Service, wholesale, or a coffee shop chain – is just as much a shop window for your customers as Amazon’s is for its customers. No matter what your content marketing, inbound marketing or outbound marketing strategy, the success (or failure) of it will boil down to the design, prowess and intuitiveness of the website it draws people towards. That’s the sum of it – but let’s delve a little deeper with five more reasons why your website is your most important marketing tool. When you walk down the high street looking for somewhere to eat, where do you go? The café with the rats scurrying in and out of the front doorway? Probably not – and that café’s not likely to be in business much longer. According to the Missouri Institute of Science and Technology, when someone arrives at your site for the first time, it takes under two tenths of a second for that visitor to form an opinion of the website, and, by association, the brand it represents. What’s more, the study included an analysis of web users’ eye movements, which allowed the researchers to quantify the amount of time it takes for users to focus on different parts of a webpage. Here’s a breakdown of sections analysed and the amount of time those wandering eyeballs spent on each section. Unsurprisingly, the results revealed that the longer each participant stayed on a page, the more positive their impressions of it were – so websites are not only important for giving good first impressions, but also for keeping people engaged for longer. The research also found that first impressions were influenced by colours used – particularly in the fact that the main background colour should be easily contrasted to the text for ease of reading. So, if nothing else, ensure that your website’s homepage is easily legible, that your logo is clearly displayed (top of the list above), and that your navigation bar is clear and concise. When someone is looking for the products you sell or a business solution like yours, they consult Google, Bing, Yahoo, or whichever search engine it might be. In the results, it’s not your social media profiles, not your tweets, not your TV advertisements, and not your leaflets that you send out in the post that are returned, but your web pages. What is more, the closer you are to the top of SERPs (search engine results pages), the more likely it is that people will visit your website, giving you that opportunity to make a good first impression, and from there make your sales. Indeed, Search Engine Watch reports that the first organic result (i.e. the first non-sponsored result) on the first page of Google enjoys 33% of the traffic associated with that search. 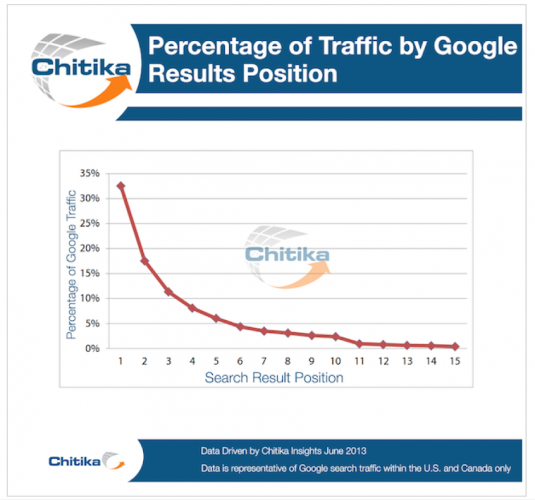 What is more, 92% of search traffic never makes it even to page 2 of Google’s SERPs. And so, if we want searchers to find our businesses, then we must work hard on our websites to ensure that they are search engine optimised and rank highly for the keywords we want to rank for. Beyond getting found and creating a good, lasting first impression, your website serves to legitimise your existence in the market. Upon first use, any prospects that are taking the time to browse your site and view your products and services need to understand that you’re a real player, and that you’re smart enough to know that your customers are weighing up doing business with you based on how you decide to present yourself online. No business is without its competitors, and in the Digital Age, a competitor with a better, slicker, more useful and intuitive website than yours will present as being more in-tune with the modern business world. Whether that happens to be true or not often doesn’t matter – for what does matter is the lasting impression that your website leaves with your potential customers. A good website markets a good brand. Your website also serves to furnish potential customers with all the information they could possibly need to learn more about what services or products you offer, and also to persuade them that your business is better placed than any of your rivals’ to serve them. For all the content marketing material that you create – be it for raising brand awareness, generating leads, or positioning your brand as an industry authority – it will all be hosted on your website, and when users arrive, they need to be able to navigate easily to the most relevant sources. Your website must demonstrate your products or services, draw visitors towards important downloads, capture their contact information, amplify your brand message, and of course serve as a sales hub to boot. In short, everything needs to take place on your website, which indeed is why it needs to be treated as the most important marketing tool at your disposal. Visits. Downloads. Engaged reading times. Return reader rates. Conversion rates. Bounce rates. Referrals. Sales. A business’s website gathers reams and reams of important customer data every second that it is live. This data can then be used to understand your customers better and how to market to them better. More than that, the data generated will also be used to help you refine many of your business processes and internal policies, and smart webmasters will have a powerful range of analytics tools hooked up to their websites to analyse user behaviour and put together a more complete image of the types of people that it attracts and, ultimately, converts. Such information gathering is all but impossible in the offline world – only your website offers you the opportunity to gain the vital insights you need to optimise your sales funnels and achieve long-lasting, sustainable growth. A business’s website is the most powerful and important marketing tool it has. And so a strong business needs a strong website. Here at Cope Sales and Marketing – www.cope-salesandmarketing.com – we design and develop top-performing, intuitive websites for corporate clients. View our Web Development page to find out more, and please use Contact page to get in touch. Looking forward to hearing from you!